Thanks go to Linda Morey Papanicolaou from Haigaonline for the inspiration! 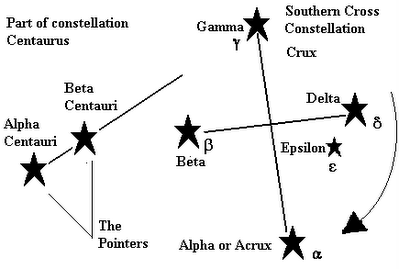 The Southern Cross (Crux) is that distinctive configuration of stars that we know on the flags of Australia, New Zealand, Brazil and many other Southern Hemisphere countries. It's an important constellation, always there if you live below 34° southern latitude, the stars of its vertical axis pointing the way to the South Pole. If there is not specifical mention, a calendar reference kigo in the database refers to the Northern Hemisphere as its place of origin. December or short night are kigo for mid-summer in the Southern Hemisphere, for example. Calendar reference kigo are for example the names of each month and then the many festivals of a specific date and the memorial days. Japanese haiku poets up from the North of Hokkaido down to the South of Okinawa have no problem when using DECEMBER as a kigo within the convention of writing haiku, for example. Where ever you are, write haiku true to your situation and experience. Haiku competitions should make adjustments by stating the place of composition for all submission. Try your hand at the daily Wordwise and Haiku challenges, with great book prizes offered by Southern Cross University Press up for grabs each day. see also Kenya Saijiki below. Look at the Haiga from Kenya here ! Carlos Fleitas was born in Uruguay, South America and still resides there in Montevideo, which is Uruguay's capital city. He writes haiku, prose, and essays in both Spanish and English. Please read the full sequence HERE !